Cybermapping is a template of the inside of things, a grand tapestry of our cumulative desires. It's our shadowmap. A scientifically rigorous "cybermap" of the West is no easy mission. First, you've got to be bored, snowed in, or, as is my case, temporarily stuck in an advertising agency in downtown Manhattan. Go to your computer, pick a reliable search engine and stick with it. In time, a picture will emerge - a picture of the relative value we place, however unwittingly, on various pieces of the West. The keywords "Colorado apres ski" in the Lycos subject box returned 357 Web sites for the first point on my map. I found that just "apres ski" or just "Colorado" was too vague, and I learned not to go overboard: "Rich, Merlot drinking Californians in velvet jogging outfits that have invaded Bozeman," for example, didn't turn up much. What does it mean? Well, one coordinate means nothing. 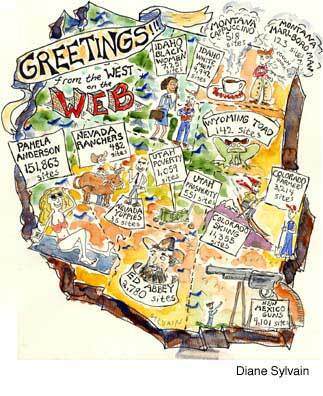 But when I typed in "Chief Washakie" and 75 Web sites popped up, I had the makings of a Western cybermap. "Colorado apres ski," 357 Web sites; "Chief Washakie," 75 Web sites. The depth of your map depends on the depth of your imagination. Type "Arizona developers" and you get 3,245 sites; type in "Arizona hedgehog cactus," a plant on the endangered species list, and one site comes up. Type "Colorado recreation" (15,759), "Colorado cowboy" (3,140), "Montana Marlboro Man" (123), "Montana cappuccino" (518), and you've got a nice coordinate structure for interpretation. Cybermapping is easy! You might argue that such a map is unnecessary; one can simply look out the window and see the writing on the Wall ... mart. But cybermapping illuminates much more complex territory than any Mercator projection or single development plan. Cybermapping is a template of the inside of things, a grand tapestry of our cumulative desires. It's our shadow-map. The truly useful information lies in the gaps - or chasms - among coordinates. Type in "Flathead River pollution" (51 Web sites), "Montana Mining" (3,906 Web sites), "Colorado farmer" (3,214), "Colorado skiing" (11,355), "Idaho real estate" (13,856), "Idaho endangered species" (1,783), "Jackson Wyoming lawyers" (128), "Jackson Wyoming Hispanics" (16). I know what you're thinking. That this kind of "technological" mapping leaves out many groups that represent the West as a whole. Of course. That's the point. Type "Wyoming toad" - on the endangered species list - and you get 142 sites. "Sundance celebrities" returns 294 Web sites, "Moab mountain bikes" returns 258, and "Navajo doctors" returns 183. Often the numbers highlight pleasant, albeit virtual surprises such as, "Idaho white men" (4,942), and "Idaho black women" (7,251). These site numbers represent a complex package of varied components difficult to interpret, i.e. "Nevada yuppies" (35) and "Nevada SUVs" (155). There are cases when the Web site numbers are almost entirely negative. "Crazy Horse Malt Liquor" (96), for example, included 90 entries that railed against the utterly bonehead idea of naming a liquor after a deeply spiritual leader. You must set your scale accordingly. It is sometimes important to acknowledge a "0" score in certain contexts, such as for "Saint Francis Malt Liquor." The main thing here, of course, is to question assumptions. You might ask yourself why the words "Wyoming extraction industries" brought up only 65 sites while the words "Wyoming liquor store" brought up 109. Keep your feet on the ground. Realize that typing in the words "Wyoming Superfund sites" (136) does not correspond to the actual number of Wyoming Superfund sites - around 167. Be postmodern: "Yogi Bear" (1,334), "Edward Abbey" (2,780), "New Mexico guns" (4,101), "Glen Canyon Dam" (1,043), "Pamela Anderson," (151,863), "Smokey Bear" (1,798), "Montana politicians" (805), "Colorado taxidermy" (733). If you'd like, you can gather your coordinates together and transcribe them from cyberspace onto a three-dimensional model, each number corresponding to a particular shape, thickness, width or color. Your model might resemble an open-air mall or the face of Ted Turner. You might find it has a belly button in the shape of George Armstrong Custer or limbs as long as the governing body of the WTO. If you look deep enough, you might find a golden temple filled with beautiful animals or the frighteningly familiar remnants of a once-spectacular land of little rain. John Kain is a poet, freelance writer and Western expatriate living in the Catskill Mountains of New York.